First published in 'The CCPA Monitor', October 2009. In a series of articles starting this month and culminating in the March 2010 issue, I present some ideas, materials, and suggestions that I hope can help map a peaceful path out of the unsustainable, violent mess called capitalism. Capitalism is a human invention that relies on theft, rapacity, extortion, and exploitation. If that description seems too fierce, it can be viewed in the light of history and against the less opprobious definition of capitalism given in the Oxford English Dictionary (The Concise Oxford Dictionary, Seventh Edition, 1982): "Capitalism — Noun: possession of capital or wealth; system in which private capital or wealth is used in production and distribution of goods; (Politics) dominance of private owners of capital and production for profit." The opponents of capitalism are often described as "the Left," and their standpoints are often described as socialism, communism, and anarchism (with various adjectivized variants ("libertarian socialism," "utopian socialism," etc., etc. ), while the term "capitalism" is often conflated, or confused, with terms such as "neoliberalism," "the market economy," "neoconservatism," even — in a triumph of post-modernist, deliberate confusion — as "democracy." So, if capitalism relies on the "values" of legitimized theft ("ownership," usually obtained through war and "defended" by other forms of violence, intermingled with theft and extortion: "accumulation," "use for profit" — usury), let's start by considering what other set of values we might use to define a human system that is a "Not-capitalism." On the following page, I have listed a set of contrasting values. If a study group wishes to explore its own values or preferences, I suggest that they start, individually at first, on blank sheets of paper, writing out a list of their own values, and then choosing the three values which seem most important to them. Second, again individually, they might then run through the set of pairs on the next page (perhaps on photocopied sheets), first to highlight their preferred value in each pair, then to make another three-fold selection of those values that appeal most strongly to them. It is tempting to think that the first conception of a "not-capitalism" is the one ethical society that can take us from the present catastrophe to a "New, Better World," as though all "ethics" are automatically "for the good." But any ethical system reflects just one set of values, so a claim that "the set of values I hold is the only route to peace and prosperity" is a dubious one, at best. Thus the value of shared — and ongoing — values-mapping processes like the one outlined above. Values-mapping — as we have just done — is carried out implicitly (rarely explicitly) by each of us on a daily, almost minute-by-minute basis. Accordingly, when Margaret Thatcher declared that there is no such thing as society, only individuals and their families, she was voicing a strong opinion held by many people: that humans are basically "nasty, selfish, and violent." By contrast, most socialists tend to take the opposite view: that human beings are basically "sociable, cooperative, and lovable." Conversely, you might argue that humans, again "naturally," are entirely pacific, and so any rule over them (be it state, religion, personal, or social sanction) is antithetical to human nature, and so you would advocate a purely anarchic human system, without any rules, regulations, or sanctions. These two viewpoints suggest that human systems are set upon a continuum — a spectrum "from right to left": from totalitarian feudalism ("family-ism," "tribalism," "fascism" or "neo-conservatism," etc.) "on the right," to pure anarchism "on the left." But human experience over the past two centuries (and our own experiences during our lifetimes) suggests that this concept is far too simplistic. Our experience is that systems of political economy — politics, economics, philosophy, sociology, etc. — are more nuanced. We see that the "Authoritarian Leftisms" of Marx and Mao, of Lenin, Trotsky and Stalin bear remarkable similarities to the "Rightist" totalitarianisms of Hitler, Mussolini, Franco, Bush, Harris, Harper, and Blair. Hence our search for a simple —but not simplistic — guide to present-day action: one that avoids recreating the perils of the past that we wish to avoid. Such experience folds back to our discussion of values. I hope that you've valued this exer­cise: please feel free to make copies for others. So, as a teaser for the rest of these articles, it might be helpful to point to two more values-mapping exercises that study group participants might like to undertake before the next session. 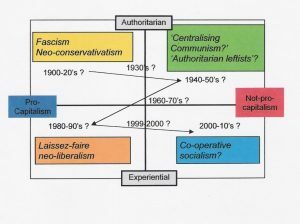 Michael Adams - "Fire and Ice" and "Environics Institute: Survey on 3SC Social Values"
one can self-explore possible variants of values sets, and their consequential political economic possibilities (noting, however, that the horizontal "left/right" axis on the political compass site is reversed as compared to the Environics map and the Co-operative Socialism map. For now, take a peek at the figure on Page 11, which I'll explore and explain next time, and please read the important Statement on the Co-operative Identity from the International Co-operative Alliance on the next page. Your study group might enjoy comparing its value sets, individually and collectively, with your own.